Black & White, circular with petals & triangles but have square boundary with T shaped openings at the center of each side of square. Colored, circular with petals & triangles but have square boundary with T shaped openings at the center of each side of square. Also I would like to know the correct way of using it. If possible I would like to know if there are some scriptures associated with this yantra. Thanks. 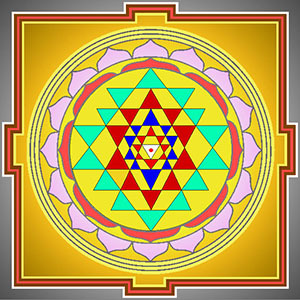 The following image is a correct form of Sri Yantra. But some other forms are also correct. Shree Chakra pooja or Yantra Pooja is the worship of a deity in a diagrammatic form. This type of worship exists in a lot of the other parts of the world also. To enjoy the benefits of Shri Chakra Pooja, you need to know Chakra puja vidhi. But, before we proceed further me must know the power of Sri Chakra and How to worship Sri chakra. The worship of Devi in Shreechakra Pooja is regarded as the highest form of the Devi worship. Originally Lord Shiva gave 64 Chakras and their Shree Chakra Mantras to the world, to attain various spiritual and material benefits. For his consort, Devi he gave the Shreechakra Yantra and the highly coveted and the most powerful Shodashakshari mantra, which is the equivalent of all the other 64 Shree Chakras put together. So, Sri Vidya and Sri Yantra worship are serious Sadhanas. One should be initiated into it and only then he is considered qualified to perform them. One can do devotional worship however, like offering incense, lighted lamps and food items to the Yantra, as per one's capabilities. You can take a print out of the image and frame it and then offer it devotional services like mentioned. You can also meditate on the 9 triangles, each one of which is presided by one of the 9 forms of Goddess Lalita, like Tripura Devi, Tripureshi Devi, Tripura Siddha, Tripura Amba etc. In the Bindu (dot) of the inner most triangle resides Kameswara Sahita Lalita Mahatripura Sundari (that is the Goddess along with Shiva). If possible I would like to know if there are some scriptures associated with this yantra. Thanks. Yes, there are many texts and scriptures. Nityotshava is one such text, which was composed by one of Bhaskararaya's disciple, and is considered an authority on the subject of Sri Vidya rituals. And scriptures include- Dakshinamurty Samhita, Jyanarnava Tantram, Sri Krama, Tantraraja Tantram, Yogini Hridaya etc. Nitoyoshodashika Arnava Tantram also gives details of how to form the Sri Yantra. The other great compilation Text called Tantrasara also quotes from various scriptures as regards how to do draw this Yantra, what materials to be used, who are qualified to draw it and what are the errors, what should not be done during installation, at what times it should be drawn and etc. Also note- If you keep this Yantra in your home along with some other Yantras, then you have keep the Sri Yantra at the right of all of them, as it is regarded as the greatest of all Yantras. And, the presiding deity of the Yantra is Sri Lalita Mahatripurasundari, who is also known as Sri Rajarajeswari. Not the answer you're looking for? Browse other questions tagged sri-vidya yantra . How to make a Yantra work?